Will there be environmental sanitation in Lagos tomorrow (this Saturday)? The Lagos state monthly environmental sanitation exercise which holds monthly on the last Saturday of the month has now been cancelled. This was announced in November 2016 by the Lagos state government and it came after a judgement by the Lagos state court of appeal. The exercise was cancelled on the grounds that the monthly exercise is unconsitutional and is a major hamper to economic growth in a megacity like Lagos where the time is never enough. TL;DR: The environmental sanitation exercise for Saturday, 26th September, 2015 has been cancelled. I guess due to the Eid-el Kabir holidays? Not sure how much sense that makes though, but then... never mind. TL;DR: The environmental sanitation exercise for Saturday, 30th May, 2015 has been cancelled. So, I've got news. There will not be environmental sanitation in Lagos state tomorrow: Saturday, 30th May, 2015. This information was provided by the administrator of the Lagos MOE's Facebook page an hour ago, so I believe it's pretty valid. I noticed that this post tends to attract some considerable amount of traffic from co-Lagosians looking to know whether or not, environmental sanitation for the month will hold as usual. This rise in traffic usually peaks on Friday, just a day before the expected sanitation Saturday. 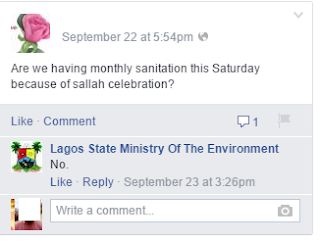 For this reason, I will now monitor both the website and Facebook page of the Lagos state ministry of Environment (MOE, Lagos) when we're approaching the last Saturday of the month. If I am ever able to find any useful piece of information also, I would add updates to this post (just below this one), so visitors can get their answers straight away. Today, I checked the website and FB page of Lagos state MOE. Sadly, the ministry is apparently on vacation and not surprisingly, this information is not available on either of these channels. Stay tuned though. You just never know what one might find. Finally, please, feel free to update the post with comments in the event that you have news on this weekend's environment sanitation schedule from a valid source. Here I am, on my own, as is the situation most of the time. I'm walking along Western Avenue in Lagos mainland, my mission, to get to the National stadium from Ojuelegba. I'm very aware of my environment, I'm enjoying the walk, revelling in the fact that I'm young and my sturdy legs carry me so gracefully. Looking at the express lanes alongside the footpath I stride on, something about the road catches my attention. The traffic is unbelievably light for this time of day. I wonder for a bit why this is the case. The reason is not far-fetched. Today is the last Saturday of the month, the states Sabbath, the monthly environmental sanitation day. On this sort of day, people are obligated by law to remain in their houses between the morning hours of 7 and 10. By default, everyone is poised to remain indoors till 10 a.m. Saturday meetings, family outings, garage sales and what have you, are all scheduled with the consideration that absolutely no vehicular movements are permitted on this day. Strange thing though is this. My phone clock says it's 9 a.m. and I'm damn sure it's correct because it's directly fetched from Airtel's server. I got to Ojuelegba from Yaba by public transport. Normal activities for the day are gaining momentum, howbeit still much slower than they would have been on a regular Saturday. Why, you ask? Well, thing is, today is another of those not so unlikely Saturdays when environmental sanitation is cancelled for one reason or another. Environmental sanitation has been cancelled in Lagos, to allow for residents to go get their permanent voter's cards (PVCs) for the upcoming National elections. I know this because I painstakingly Googled the hell out of Google last night. "Would there be environmental in lagos tomorrow", I asked Google. Alas, no relevant results came forth, till I added such keywords as "January 2015". Only then did I find an article which stated that the state had cancelled Sabbath for today. This leaves me wondering where on earth the journalist who wrote the post that announced the cancellation got his information from. Really, MOE Lagos, what other news source deserves to have more up-to-date information about you than you do. C'mon, do you not know that it is to prevent such occurrences as this for this that a huge budget has been provided for the running of your website? Fix the non-functional links on your menu by the way; as at the time of this post, only a half of your menu items are clickable. Yes, I know as a good citizen, I should be reporting this to your office. Emm, sorry, I don't give that much of a hoot. Well, now, ain't I being too hard on the poor Ministry. It's nothing but a government parastatal full of lousy old staffers (who are in turn full of the complacency that the system has drilled into them after decades of work-free work) after all. It's not like I truly expected any more than this from you (MOE, Lagos) anyway. As a matter of fact, I am positively surprised that you have a decent looking website, interestingly more so than the state website itself. Anyway, for the 'koko' of the article, I've been inspired to brainstorm on ways to cash in on this laxity on the part of the government. I perceive that there's a real need out there, for this information which is sometimes not available until it's too late to re-arrange plans made by default consideration. I'm thinking, I'm thinking. Would you like to know what I'm thinking? Well, me too, I'd like to know what you're thinking. Tell me what you're thinking and trust me to be so open as to let you know what I myself am thinking in this regard.